Thai food is one of our favorite world cuisines. We have a Thai restaurant close to our house and the fried rice you get there is something I crave for at times. I love their coconut chicken curry which seems to be closely affiliated to Keralite (South Indian) food. I made the 'Thai Style Chicken Corn Soup' for dinner tonight which was the ultimate comfort food for the dismal weather contributed by Sandy!!! Our elder son, Nathan is not fond of chicken. He likes chicken cooked only in certain ways. I had tried several times to sneak in chicken in his meals and every time he figures it out. I guess he got some super sensitive taste buds!!!! He is one of my best food critics though. Pediatric experts suggest keeping trying the same food on a picky eater at least 14 - 15 times before you give up. I had tried it and lately I am noticing a difference in his approach to chicken. 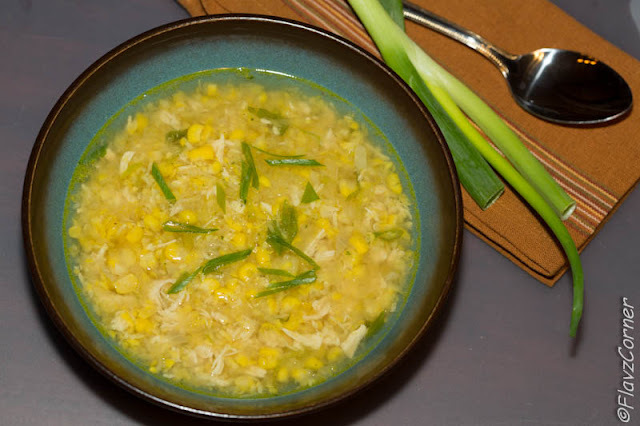 Since this soup incorporates one of his favorite vegetable - corn, I didn't have to ponder much on another dinner idea. · Heat 1 tsp of oil with half of the minced garlic in a non-stick pan. Add the chicken breast salt and pepper and cook till well done. · Transfer to a chopper or food processor and process it into small pieces. · Cook 2 cups of corn kernels with 1 tbsp of water on low flame in a covered non-stick pan. If you are using frozen corn, you don't need to add additional water. · Transfer to a food processor and puree for few seconds till creamy yet with some texture left. 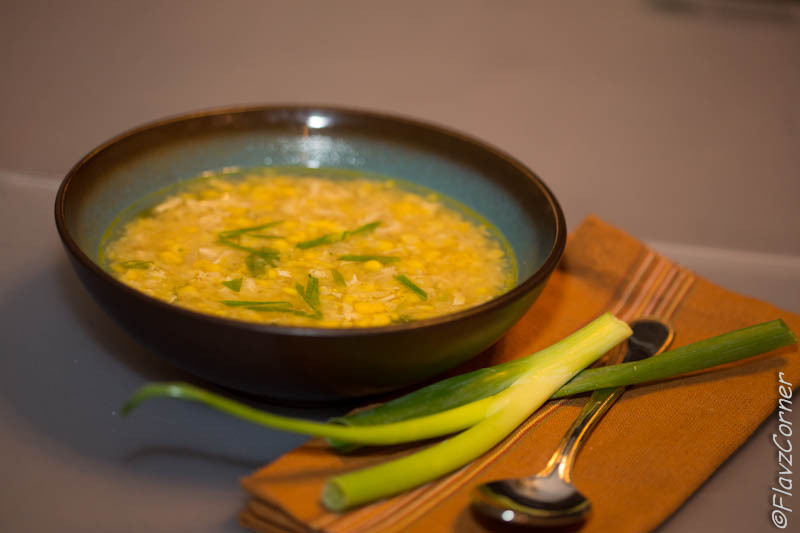 · Heat 2 tsp of oil in a heavy bottom saucepan and cook the minced garlic, ginger, shallots, chili paste and green onions until softened, but not browned. · Add chopped chicken and sauté for 2 minutes. Stir in the creamed corn and chicken stock. · Bring to boil, cover and cook till desired consistency and season with salt and pepper. · Garnish with Cilantro leaves or green onions.